Explanation: The Pacific Ocean and Chilean coast lie below this sea of clouds. Seen through the subtle colours of the predawn sky a lunar eclipse is in progress above, the partially eclipsed Moon growing dark. The curved edge of planet Earth's shadow still cuts across the middle of the lunar disk as the Moon sinks lower toward the western horizon. 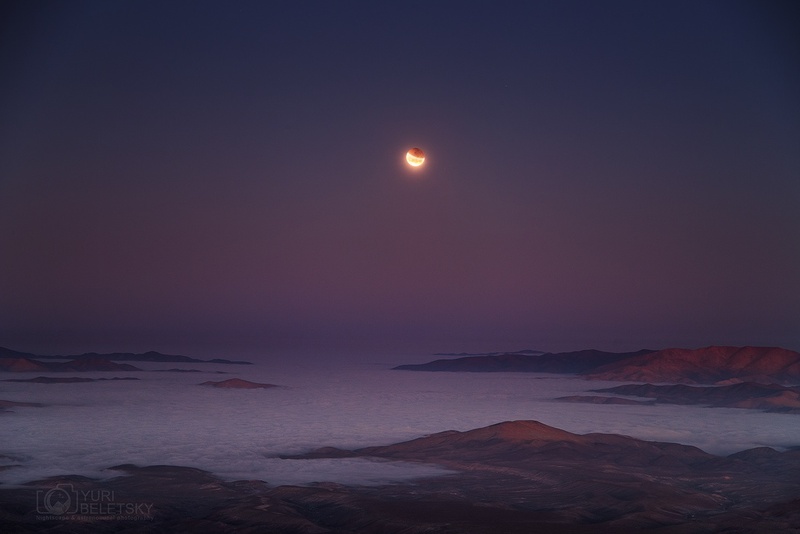 In fact, from this southern hemisphere location as well as much of eastern North America totality, the Moon completely immersed within Earth's shadow, began near the time of moonset and sunrise on October 8. From farther west the total phase could be followed for almost an hour though, the darker reddened Moon still high in the night sky.